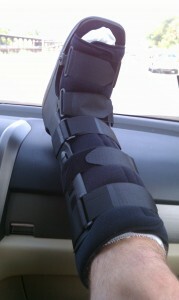 Well, I hobbled around for 3 days before my surgeon could see me. I kept the ankle wrapped in clean gauze and an ACE bandage to keep it somewhat immobilized. It’s weird - at first, the injury was only mildly painful, and I still had good dorsi- and plantarflexion. But as time crept on the pain increased. I got some significant bruising on my lateral ankle and dorsiflexing at all was very painful. I was back on my crutches/scooter, and reminded how terrible non-weight-bearing is. It really is awful. A couple bad experiences while not immobilized: 1) when I start to fall asleep, my legs kick (I’m one of those weirdos). Every time they did this my calf muscles contracted and pulled on my retorn tendon. Not a fun way to fall asleep. 2) Trying to take stairs too quickly on crutches and falling down 5-6 steps. My wife, who weighs a little more than half of me, was at the landing below, and tried to catch me. It did not end well for her. She said that she would have felt terrible if she had just moved out of the way though. Just ended with some cuts and scrapes after that one. Anyways, went to my orthopod yesterday. They confirmed the rerupture with the Thompson’s test. He said the defect isn’t as large as the first time, whatever that means, but he recommends surgical repair. He was less than sympathetic. I asked him if maybe I had been weakening the repair with all the walking I had been doing, since I had started having increased pain around my ankle. He said that no, that was a normal part of the rehab process, and I probably just overstressed it with my jump into the water. Ugh. Anyways, I got out of there with a new leg apparatus, which surprisingly is one that he never gave me during my initial recovery. The weird thing is, it keeps me closer to neutral, which is more painful then just a splint with equinus. If there’s any advice I can give to those in recovery, it’s not to rush the rehab process. It’s actually the same advice that the guy who sold me my knee scooter gave me, and I clearly summarily ignored. Don’t think that you’re going to be to 100% in 2 months. It just doesn’t happen. Take your time. It’s not worth throwing 8-10 weeks away. I’m heading down to Houston in 2 days and am seeing a new orthopod down there. I assume he’ll also recommend surgery, which I assume I will have. It’s frustrating to basically waste 10-14 days in the walker before going to the OR, but I guess we have to do what we have to do. Another update to follow that appointment. Sorry to hear that man. I re-ruptured mine June 18th after 4 months of trying to get better. I initially “severely pulled” my achilles during basketball, with MRI showing no tears. Went conservative treatment with the boot. 4 months pass, last exercise to be discharged from PT, one legged jump with a stick of the landing, and I heard a loud pop. When I hurt it the first time I just got that feeling that Bruce Lee kicked me back there, no pop. Anyway, I am a grown man and I was sobbing on the floor in the PT’s office. The look on his face took me weeks to mentally overcome. Things get better though. I still have a long way to go. I went to the Steadman Clinic in Vail and had the FHL transfer by Dr. Clanton. I was so devastated, I told myself I was going to get the best surgeon I could. With the FHL transfer, I cannot move my big toe up and down that well anymore, but I hope it will not be a big deal down the road. The FHL is the bodies’ second strongest tendon, so anchoring that to the Achilles is going to help lessen the chance of re-rupture, which I cannot mentally take again. However, when all is said and done, consider it this way, you are pretty much at rock bottom right now. Once I had surgery it felt like things were looking up. But that first month, was hard on my brain. Good luck, both of you. Hoody, FWIW, I’d put a couple of heel wedges in that boot while you’re getting multiple opinions. If you go under the knife, it won’t matter, but if somebody convinces you to skip the surgery, you’ll be farther ahead. BTW, if your main reason for preferring surgery is a lower re-rupture rate, you should check the results of the four randomized studies done post-2007, maybe especially UWO — ejbjs.org/cgi/content/full/JBJS.I.01401v1/DC1 and achillesblog.com/files/2008/03/jbjsi01401v1.pdf . There was a small “raw” difference in rerupture rates — 3 out of 75 for the non-op vs. 2 out of 75 for the surgical — but (a) those results are too close to be statistically-significantly different, and (b) they’re both so close to zero that they probably only include people who fell or otherwise accidentally over-stressed their still-healing tendon. I don’t think there’s much to choose there. The UWO results do show a slight bias in strength in favor of the post-op crowd — again, generally too small to be statistically significant, but pretty consistently biased toward the “op” side. Whether that’s enough to put up with the added pain and cost and risks and out-of-commission time of the surgery or not is a personal decision, depending on circumstances, etc. Good luck whatever you decide — you’re due! reading about you guys makes me turn cold. I really wish the very best for both of you but appreciate you so much giving the advice about not rushing it. Popping it again after so long and in PT is very scary and I guess sounds like it could happen to anyone at anytime. I really really hope you guys have a good outcome. My PT has told me to ditch my boot but I’m keeping it for grass and sand at the moment. Hoody, my first comment above was held for moderation because of the long URLs, so I tried again with shorter URLs and it worked. You approved the first one so it’s viewable now, but they’re redundant. Please delete one of them. I hope nobody takes away the advice that slow rehab is better than aggressive fast rehab, because it’s not — and it does not reduce the probability of rerupturing, either. Hoody re-popped his at 8-ish weeks post-op, by jumping from a boat to a raft in bare feet. That’s not part of the Watch Your Step that we all have to follow, no matter what protocol you’re following. Using a boot for self-defense in risky situations after 8-ish weeks (as Sheena is doing) makes perfect sense, but delaying WB or gentle exercise or PT to be “extra safe” makes no sense. There are more choices than just “fast” and “slow”, or “take lots of risks” and “wait forever”. I like a slogan that the PR company for old MG sports cars used in their ads: “Safety Fast”. And unless you have really good information and really good judgment (or a Doctor who’s currently involved in state-of-the-art trials), you’re probably better off following a modern protocol that got excellent results (like bit.ly/UWOProtocol ) than any other path. Yeah I have to agree with Norm on this one. After I reruptured I placed all the blame on the surgeon for not letting me know what I could and could not do. What I did to rupture was basically a calf raise. I figured, I’m young and healthy, I shouldn’t rerupture doing what is basically part of a rehab protocol. But now I think I was more than a little arrogant in my approach. Even though I had an insurance gap, I should have seen a physical therapist once and gotten some advice there. Before the rerupture, I was being more aggressive with ROM exercises and my tendon was feeling better as a result. I’ll amend my takeaway to: don’t think you can do more than the experts say you can do. Do your PT daily - don’t slack off of it. They will guide you towards healing. But don’t think that just because you’re young and/or it’s been feeling good recently, that you can accelerate your healing process. Give it the necessary time. I was the same way Hoody. I am an avid barefoot runner, Podiatrist told me to wear shoes as I came out of the boot. I did not not, wore my five fingers. Podiatrist said do not ride outside in the event I get in a bicycle accident, stay on the trainer in the gym. Did not listen to that. Podiatrist said to take it easy, I go climb Bear Peak, Mt. Silverheels, and Pacific Peak in 3 consecutive weekends. I was not giving this injury the respect that it deserves. The amount of scar tissue I generated with all this activity so early (within 2.5-4months of the injury) was not good. It did not matter how much I iced, or elevated it. I simply did too much, too early and paid for it. The conservative approach would have worked for me had I just been patient.